The main chip adopts the HIFI PCM2704 USB decoding chip, the power supply adopts USB power supply, the output can be directly connected to the headset, and it can also be used as the pre-stage digital output, which can provide SPDIF digital signal for more advanced DAC decoder to obtain better sound quality. External sound card, to avoid serious electromagnetic interference in the chassis, the signal to noise ratio and sound quality can be improved. PCM2704 is a monolithic digital-to-analog conversion chip. It has two digital-analog conversion output channels and an integrated USB interface controller. The interface complies with the USB1.1 standard. The PCM2704 can receive 16-bit stereo or monaural audio data at 48KHz, 44KHz and 32KHz sampling rates. The chip integrates software volume and mute functions to synchronize the volume and mute of the computer. Supply voltage: 5V (USB power). Distortion: THD+N: 0.025% (RL = 32 Ω). Headphone output power: 12 mW (RL = 32 Ω). 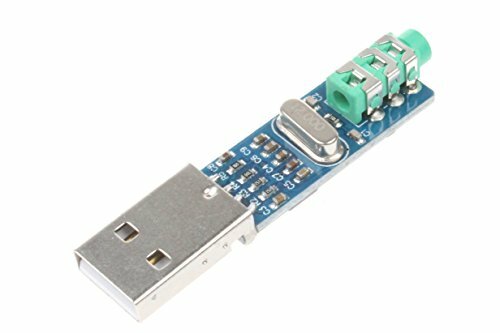 USB supports sampling rate: 16BIT/32-48KHZ. USB support system: Win XP / Win 7 / Win 8, MAC OS 9 / OS X, Android 4.1 and above (Need to support OTG models). Supply voltage: 5V (USB power). Distortion: THD+N: 0.006% (RL > 10 kΩ), distortion: THD+N: 0.025% (RL = 32 Ω). Headphone output power: 12 mW (RL = 32 Ω). USB supports sampling rate: 16BIT/32-48KHZ. If you have any questions about this product by NOYITO, contact us by completing and submitting the form below. If you are looking for a specif part number, please include it with your message.